A new website (with an accompanying mobile app) called Keewords, created by Perfect Fools, is here just in time for the summer holiday season to teach us the basics of 12 languages so we’re not left embarrassed, confused and crazily pointing at that croissant. According to Keewords, people only need 1,500 words to understand 75% of a language, so instead of getting bogged down by grammar or boring scenarios you’ll NEVER experience, Keewords teaches you a big chunk of words that you’ll need in everyday situations. You begin my signing up and choosing what language you speak now and which you’d like to, you can choose from Arabic, Chinese, French, German, Greek, Italian, Norwegian, Polish, Russian, Spanish and Swedish, which is a pretty good mix. Don’t be scared about committing yourself to anything at this point, you can remove and add languages and courses really easily. Once you’ve picked the language you’re interested in, you can choose which course you’d like to take and there are lots of different levels depending on whether you know any bits and pieces already. 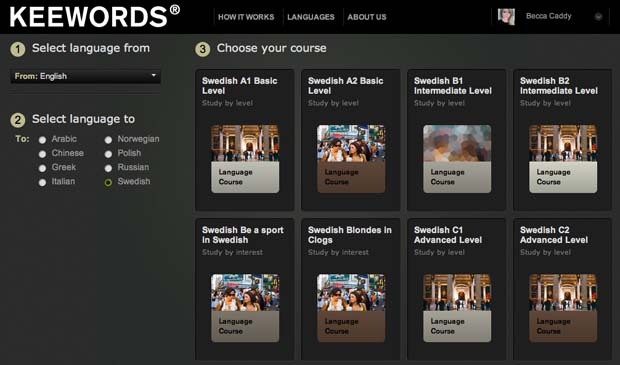 We chose Swedish and the “Swedish blondes in clogs” course to begin with. WHY NOT? You then begin your course and the whole idea behind Keewords is that it’s best to learn new things by seeing them, memorising them, repeating them and testing yourself after, just like you did in school. So you see a word in English you press “flip” and the card flips around showing you the Swedish (or whichever language you chose) translation and a lovely foreign person pronounces it for you. You can then flip it back, test yourself, write the word out, repeat it, whatever you want until it’s stuck in your head. As you work through the different words you can track your progress and see a little bar chart clocking up how many words you’ve studied and how many you know off by heart. There’s also a circle at the side showing how much of the course you’ve got left to learn. As Keewords wants to make learning another language easy and also really useful, you can choose subject categories, so you only learn what’s important to you and not how to tell someone their car needs fixing or their grandma looks old. You can take tests along the way after you tick off each section and at the end you can take a final exam and be certified by the Common European Framework of Reference (CEFR). The idea behind Keewords is great, but the way the whole site works as a whole clearly has a user’s experience in mind. The controls are really intuitive, it looks slick and modern and you can take different courses, set yourself challenges and see what the rest of the Keeword community is up to all from in the main dashboard. If you’d like to learn on the go, then there’s an accompanying free mobile application for iOS devices too (we’re told the Android version is on its way) which you can download from iTunes. It’s important to remember that Keewords won’t give you a degree in Russian or enable you to reel off lengthy monologues in German, but it’s a great tool to get you through a holiday with confidence and teach you the basics. Oh and if you’re anything like us it’ll make you feel pretty damn clever and international in the process. Overblog launches new platform: But do we REALLY want all our online activity in one place? Keewords teaches you a big chunk of words that you'll need in everyday situations. According to Keewords, people only need 1,500 words to understand 75% of a language, so instead of getting bogged down by grammar or boring scenarios you'll NEVER experience, Keewords teaches you a big chunk of words that you'll need in everyday situations.